While on the prowl in Rotterdam, ScreenAnarchy bumped into Steve Oram, the English actor who may be spotted in television series Tittybangbang, The World´s End or Ben Wheatley´s chiller Kill List. Steve Oram co-wrote Wheatley´s dark touristic comedy Sightseers where he stars alongside Alice Lowe, who was not only his acting but also writing partner. The time was ripe for Steve to complete his feature directing debut, charmingly titled Aaaaaaaah! (read Ard´s review), a family drama cross-over between Planet of the Apes and A Clockwork Orange. Oram plays with the spirit of midnight movies interweaving schlock, bleak and surreal humor and socio-evolutional musings during which is not uttered a single one word. The British director was accompanying the film in Rotterdam, where it played in renewed genre sidebar Genre D.N.A. At the occasion, ScreenAnarchy sat down with the good-humored director and was curious about the project and the discussion eventually touched also on topics of cult films, genre films, shoestring budget filmmaking and the future of cinema. 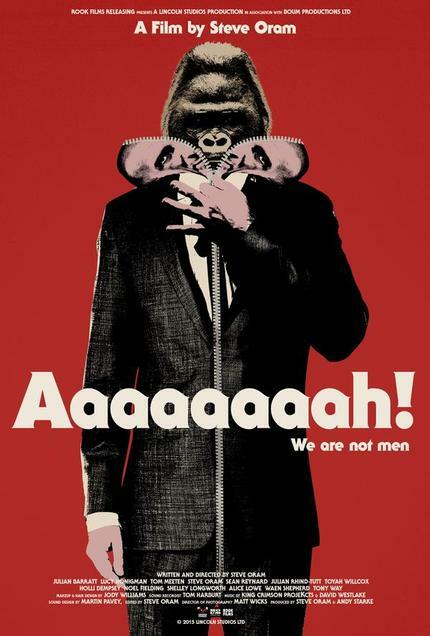 ScreenAnarchy: Your film Aaaaaaaah! reignites the long lost nostalgic vibe of midnight movies. What is the genesis of the project? One idea used in a short film made it alive, and that is the question how would people behaving like apes live in the contemporary world. So, I took that and went around with it and I think there is no other way to make such movie but with a sense of fun about like those midnight movies had. I am a massive fan of John Waters and Alejandro Jodorowsky. These people are geniuses, they have such a sense of fun about what they are doing and I hope that comes across in my film. It has partly to do also with budget since we had no money, so I wanted to make a virtue out of the fact we did not have money and film it very low-fi to not be too precious about shots. But the film digs deeper beyond the fun part scratching almost philosophical layer. Yeah, sure. That started to became apparent but the idea for the film came from fun and then as soon as I started working on it I realized, there was more to it. But to do that and getting across the thing was to underplay it. Just throw away that side of things. You know it is there, if you want to read but you may as well read it like a piece of scatology. But this must have surely played a role in dramaturgy of the film, especially when characters speak only in shrieks, screeches and grunts. Well, there was a script. I wrote it in English completely like a conventional script. And then when we went to work, we had to find a meaning with actors to reenact the scenes without the language. I worked with actors very closely and they were just forces coming into the contact with each other. It is simple. I think that is the keyword. But you had regular lines? Yes, everything was written in a dialogue. And the actors had to translate that in gestures and shrieks? That´s right. They could approximate it however they wanted to do or they could do nothing, just blankness and staring. Have you had some sort of physical workshop for the project? We had lots of workshops and the thing about these actors is that they mostly come from comedy background. A lot of them were very skilled anyway in physicality of being an ape or however you wanted to be. So it was very natural to them. And when we started workshopping, everyone found its own way of doing it whatever seated best to their characters. And that was a big part of it. But for example Julian Barratt seems to be coming from very different branch of comedy. Didn´t he have a problem with it? No, they were all up for it. Speaking of Julian Barratt, I must say, what he does in the film is a brilliant piece of acting. I mean he has the most serious role in the film. Yeah, and it is the heart of the film. It is so sad and when you see him in the film, you just want to cry. And Noel´s [Fielding] character...I mean it is not you would generally see him doing which I like. Noel was really funny and a fun to work with. And he even did not wear any fancy nor extravagant clothes. Right. This is the worst you ever see Noel look. You are not only the director but also starring in the film. How was it? It was very hard. Because you can´t get an oversight what is going on, you have look at playback and that makes everything take longer. Those days when I was acting and directing were really hard for me but I am pleased to get over it. So you did your piece and watch the rushes? Yeah, that´s right. But I would not have always the time, and if I did not have the time I felt really out of control because I am a control-freak. It was difficult but I am pleased with the work and how it came out. How long did it take to shoot the thing? We shot it over two weeks. I think twelve days. And then the postproduction, I edited the whole film myself, took probably three months - postproduction, the editing, sound. It was really quick. Is there a major difference between the original script and the final cut? No, it was very very tightly structured shoot. We had no time to deviate, so we did not do any long improvised bits. We had to shoot basically what was there on the page. I had probably one twenty-seconds-long scene I left out. And that was it. It was all about planning which I think is the thing you have to do when you are on low-budget. You have to plan so meticulously. ...that´s right, I was. I did a voice-over because I work as a voice-over artist and they paid me a large amount of money and I thought I would do this film. It was an idea I had for long time, so it was great to have that creative freedom and the speed of idea-to-page to doing it was like nothing I have ever worked on. It was brilliant to be so creatively free. You were not that free on Sightseers? That was a different thing. The development of Sightseers took six years. We were working with people on film forum, developing the script, a lot people involved in the project and then the thing with funding. It was a very long process and I wanted to skip that and just make a film. I called my friends and said "Do you wanna be in a film?" and we put the cast together pretty quickly with the help of Andy Starke, you probably know him from Ben Wheatley films, he is the producer on those. He is an amazing producer, the king of low-budget and very inspired to help people like me. How come you and Ben are so inclined to British comedy actors? He had a nice troupe of well-known comic actors including Julian Barratt in A Field in England and now you. That´s right, lucky me. We all work in TV comedy that´s how we met each other and it is a quite small scene in London. So we are friends with a lot of people. They are all brilliant peers. Yeah, right... it is specific English sense of humor so grotesque but with surrealism and silliness thrown in it. I love The League of Gentlemen. Did you think about hiring drama actors to make them do silly things and to push the subversion further on? Well, I would have loved to. I would love to work with anyone but it depends whether they are up for it. Not everyone would have wanted to have somebody´s testicles on forehead. It just takes a certain type of person. Is Aaaaaah! influenced by some specific comedy brand or concrete filmmaker? No, it is just my comedy taste and my childhood enjoying shows like The Young Ones and all that great comedy stuff that was on in the 80s. It all comes from that really, I am sure of it. Those comedy shows were known for the sense of anarchy, Monty Pythons are similar, the sense that anything could happened and I drew from that. Does the anarchy reaches further in your case. I mean in terms of social parable? I guess it has to do with us being apes. Really, we are all apes in the real sense but we still pretend we are not. ¨We are wearing clothes and are quite pretentious. Every single human is pretentious because we think we are not apes but we are actually just filthy horrible beasts. And I think there is the sense of anarchy, the bubble grows and the surface of our society or any society in the world is barely referenced. There is nothing in my film that does not happen. ...yes, that´s right. It is very well structured society and very male dominated. Dominated by idiot men, always displaying, showing off whereas women are much more pragmatic, they take action. And that is what we are trying to do in the film and just get on with it. Regarding distribution strategy, so it had run also in theatres. Just in UK. We went around the country with it. Was it your idea to use iTunes within the distribution model? We came with Icon distributing film and it seems like a good way to get the film out there, very available on all platforms. Now we have coming out DVD and Blu-ray. And that is brilliant. It has loads of cool extras. No, just this cut. I did not have any extra material, really. I am glad, I would never do a director´s cut. Never. That is mostly applicable to studio productions when producers have the right of final cut. Yeah, I did not have anyone telling me what to do. That was brilliant. What is your standpoint in discussion of classic distribution versus digital one? It is very easy to get lost in the VOD. There is a slightly too much of that which is not a shame. But I think it is yet to even out, it is yet to find out, it is still a fledgling industry in that way. It might get worse. It might get better. I do not know. But it is great, you know, you have to be out there. The world is as it is. You just have to be on those platforms. And I hope my film has a long life. You just leave it there and get on with the next one. That was also partly my reason to do it so low budget and I think that is probably the future. The budgets will get smaller and smaller and margins will be much less workable. Everybody has to be just ready to slim down, I think. It is sad state of affairs. Everybody says that but every year there are thousands of movies. But I guess you have bigger budgets in UK. Presumably. Well, someone is getting the money, I am not. How can you market your film when you mentioned the boom of content on VOD? There is no one else making films about people talking like monkeys. It is a one-man-genre. In this environment, where anyone can make a film, you have to stand out, you have to be bold. It is the new B-movie so the virtue being able to do stuff so cheaply, you need to remember any bugger can do that. The worst filmmaker, someone who´s got a half-idea, they can just make it happen. You have to be really bold and present something that is not in the mainstream. And that is what I am trying to do, hopefully, and will continue to do something that people can´t get anywhere else which is our duty as filmmakers on the lower end of the money. Speaking of money, have you tried to find somebody to fund it? ...yeah, before that but they knew, it was written on the script what it will be. But they decided to do a very big mainstream film at that time. It did not quite sit with what they were doing then. How long was the script by the way? Around seventy pages, a proper length. You mentioned that because of the low-budget, it is a B-movie. Do you think there is a correlation? I do not think so. It has to do more with the script. We can take more from the film so it goes beyond the entertainment only. Sure, that´s right. It is a serious thing. You inevitably end up in that category but what can you do. It is more about having the money to spend in the postproduction, so you can do publicity. That´s where all the mainstream people have the advantage. It is the post making a film. Having an extra hundred grand for me to do a publicity for my film, we could have done something else. Your film is here in a genre section. What is your relation to genres? I love it. Genres are there to be messed with and I think that a lot of fun stuff is done in genres. We are big fans of horror films and all that stuff that is going on at FrightFest. It is a place for people to have fun. I think genres are good for defining, you know what you are going to get. And then the best stuff hovers around genres and that is why this strand is so good, so interesting. It is not a horror, it is just between horror and comedy, something where great stuff happens. Were you thinking of innovation of genre while making the film? We were not consciously making a horror film. I knew it was comedy and that there are elements of gruesomeness. It is an extreme film so where do you put it. We are sort of inevitably and happily in the horror genre. It was not conscious thing. That was just an idea. You know, we are not a part of the mainstream, we are not doing things in the mainstream way, so we end up in the genre places which I enjoy. I love all the genre festivals, it is just amazing fun. It´s good to be strange as they say. Does the film reflect somehow the political climate in UK, which was a bit turbulent recently. It is not a political film at all. I do not have a head for politics. My film is just about human observation and that is what I really like. It does paint a picture of us obsessed with gadgets, these sort of things and crap telly. It paints picture of our environment in UK. And that is as far as it goes, no comment on politics just people. A Clockwork Orange might have come to mind watching your film. Was this in the mix maybe? I did not think about any film in particular when I was making it. Obviously, I am a massive fan of the rebellious anarchic films of the 70s. That is the best decade. They made some great stuff then, if you remember the filmmaker Lindsey Anderson, he made incredible films. Do we need anarchy today? Definitely, we do. And not enough people are doing it in art, very few which I find very sad. But I find it a fantastic opportunity that people can afford to make films. All you need is 10 000 pounds and you can make a film. ...lower than 10 000 pounds? No, I am not telling. But that is the environment we are living in and people should get out there and make some angry films. Are you already contemplating your next project as a creator? It is a bit too soon but I will spill it sooner than later. Are you engaged in other projects? There is Irish horror film called A Dark Song coming out and I am playing an occultist in it. It is going to be great I think. It is very dark, very intense. The film is psychologically violent. I play an occultist who goes through a deserted house with a woman who is trying to find some answers about the death of her child. We start a ritual that lasts for months. We have very intense relationship and dark things happen. I have not seen it yet myself but when I talked to producer, he seemed very happy with the result. Aaaaaaaah! can be watched here and Blu-rays and DVDs are available here.